Lost and Found: Discovering Strength in Love and Faith - Kindle edition by Carol deLaski, Linda Brennan, Susan Berry, Jess deLaski. Self-Help Kindle eBooks @ Amazon.com. Carol had lost herself in the trials and busyness of life. On her soulful journey to find healing for her fractured heart she takes us from a desperate winter night in a snow covered field to a joy-filled, spiritual trip to Europe where she encountered a surprising appointment with the Divine. In her search for love she found that the most important relationship of all resides within her. 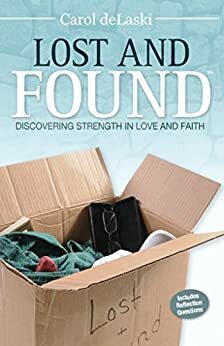 If you have been lost, discouraged or short-on-faith, Carol's insightful writing and coaching style will guide you inward to find the resilience and strength necessary to overcome adversity and to thrive. "Carol seeks meaning and wholeness by learning from the failures and building on the gifts that come her way. The result is a testimony to the way that love in relationships is intertwined with the love of God." Bruce C. Birch, Dean and Professor of Biblical Theology, Wesley Theological Seminary, Washington, DC. "Carol is a gifted leadership coach whose thought-provoking and enjoyable book is a great springboard for those seeking love and faith." Carol deLaski is a certified professional coach (CPC), author, and speaker. She has been an entrepreneurial businesswoman for much of her life with over 25 years’ experience in the telecommunications industry. Her passion for clear communication and human development led her to create Clear Choices Coaching, where she provides strengths-based leadership training for businesses and individuals. Carol is a co-founder of Wholistic Woman Retreats™, a nurturing community which offers enriching and supportive events for women-on-the-grow. Having learned the importance of self-care and taking breaks from the hectic pace of life, she now provides such opportunities for other busy women. She believes that whenever we pause to nurture ourselves we are engaging in a retreat. This community offers programs designed to develop the whole person in body, heart, mind, and spirit. Participants grow stronger in self-awareness and self-care, thereby creating deep and genuine connections with themselves and with others. Carol is a member of the International Coaching Federation (ICF) and has a Bachelor of Science in Education from the University of New Hampshire. She received her coach training from the ICF accredited Institute for Professional Excellence in Coaching (iPEC). She resides in Maryland. 5.0 out of 5 starsInspirational and uplifting! I happen to be lucky enough to live near Carol and have attended many of her workshops and am a member of the wholistic women's group she founded with 4 other life coaches about 4 years ago. Carol's book is a true reflection of her belief system that we are all striving to be the best we are meant to be and that each of us is on our very own journey with our unique way of getting to where we are meant to be. As Carol would say "we are all exactly where we are meant to be". It was very inspirational to read and relate to many of Carol's life experiences and it was amazing to me how her book touched so many of my friends in so many different ways! With the first reading I skimmed and skipped the personal reflection questions at the end of each chapter, eager to follow Carol’s story. Crying, laughing, and cheering her on, I was easily drawn into this inspirational story told with humor and candor. A quick read. The second reading is slower, drawing on Carol’s illustrated experiences and considering her reflection questions to ponder my own journey. A great tool for my own private retreat or for group discussions. I 've purchased multiple copies to share with friends and family. A friend gave this book to me. I liked the title, wasn't sure about the whole subtitle thing about discovering strength and love. I'm really tired of reading those kinds of books. Anyway, I opened the book to a random chapter, which happened to be about the close relationship between between the author and her mother and a trip they took to Germany. I read it the day after Mother's Day and so it held particularly meaning for me because my mom and I are also really close. So that was nice. I wound up going back to the beginning of the book and reading it through. It's definitely worth a read and I've actually purchased it for a couple of other friends and they've both enjoyed it. One heads-up, though. The books about the author's spiritual journey, so there's a lot of God-talk in it. I didn't grow up in a Christian tradition and usually can't relate. But the author wasn't trying to ram it down anyone's throat, it really was about journey, which makes it more universal. What I do often do when reading these kinds of books, is just substitute words, so instead of God, I'll use "Spirit" or some other word. It's probably all the same thing anyway. I started reading Carol's book one evening, and did not stop until I was done, late into the night. I kept telling myself I would stop at the end of the chapter, but then I'd want to see what happens next! Carol wrote the story in such a way that you feel you are a part of the story, right there with her. At different times throughout the book I laughed, I felt embarrassed, I cried, then I laughed again. I felt that I was right there with Carol, along with her on her journey. Carol has opened her heart, and is not afraid to show her vulnerability, which makes this story hit home. I could see myself in parts of her story - the experiences she had while traveling, interactions with family and friends, and her struggles with faith, self-confidence, and other aspects many of us struggle with. Carol has written the book with reflection questions at the end of each chapter; however, I was so intent on reading it as a story, that I passed right over them to get to the next chapter! I am looking forward to reading the book in a more leisurely fashion soon, and taking the time to do some reflecting. Excellent book, details Carol's journey to find herself. At times it seemed that she was telling my story, I could identify completely with her situation. I only wish I had the "guts" and ability to be as introspective as she was. In addition to reading about Carol's journey she provides thought provoking questions at the end of each chapter. They can lead to serious soul-searching which are very helpful. No matter your age or religious beliefs, this book will make you think. It is certainly a book that should be read. I also recommend the Audio. this was great to listen during my travel. great stories that developed into the realization that things happen for a reason and that the road you are traveling has many signs and obstacles in your path that will help you on your journey. I am much more aware and excited to travel my journey with the awareness, reflection, and clues that were presented in Lost and Found. This little journey changed my life-Thank you! 5.0 out of 5 starsthis little journey changed my life! -Thank you! this was great to listen during my travel. great stories that developed into the realization that things happen for a reason and that the road you are traveling has many signs and obstacles in your path that will help you on your journey. I am much more aware and excited to travel my journey with the awareness, reflection, and clues that were presented in Lost and Found. This little journey changed my life-Thank you!